Toronto’s first medical officer of health, Dr. William Canniff, recognized that disease could be transmitted through anything that one ate or drank. 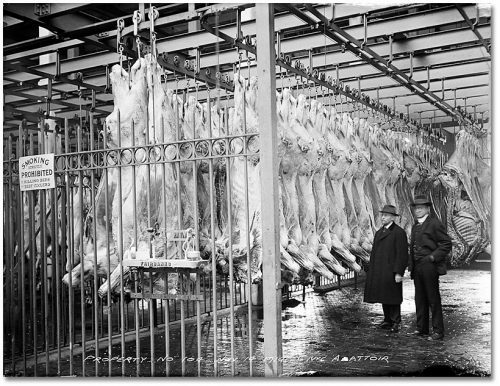 To ensure the quality of food and prevent the spread of contagion he hired inspectors to investigate dairies, slaughterhouses, groceries, butcher shops, and bakeries. 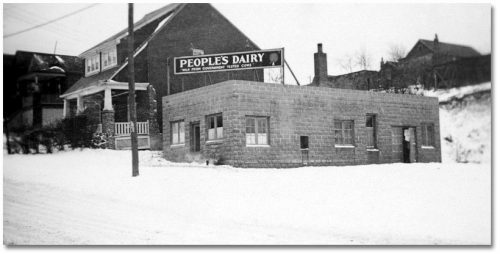 By 1893 the department had established standards for milk (to ensure that it was not being watered down), butter, and bread. Eventually, the Department of Public Health became responsible for investigating conditions and staff wherever food was handled, prepared, or sold, including factories, stores, and restaurants. Dr. Canniff and his successors paid particular attention to milk. 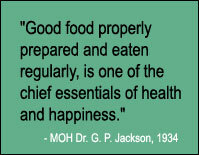 They saw it as the perfect food, vital to a nutritious diet for people of all ages. However, milk could also be dangerous — a common source of diseases such as typhoid and scarlet fever. Unlike vegetables, milk could not be washed, and unlike meat, it was usually not cooked before consumption. 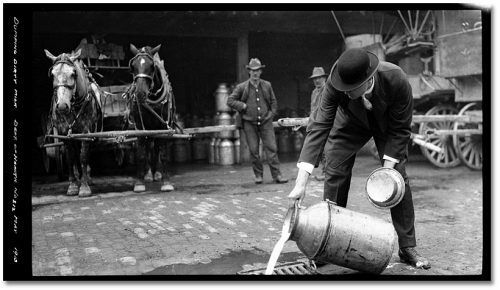 Even if milking pails and bottles were kept clean, there was the risk of catching bovine tuberculosis, which originated in the cows themselves. Infants and young children were particularly vulnerable since they drink the most milk. The Department of Public Health tried to ensure that milk was safe by inspecting farms and dairies, and it also licensed dairy farmers. 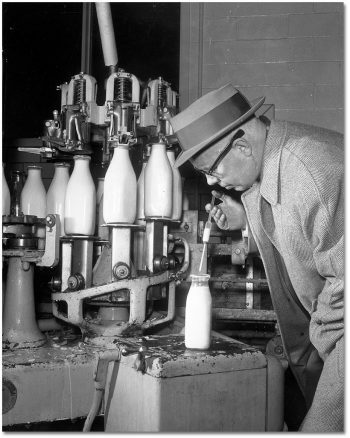 Pasteurization of milk (heating to destroy bacteria) was the most effective way to prevent the spread of disease, and it became compulsory in Toronto in 1914. One of the strongest crusaders for milk cleanliness and pasteurization was Medical Officer of Health Dr. Charles Hastings. He lost his young daughter to typhoid, which she contracted from milk bought at a city dairy. 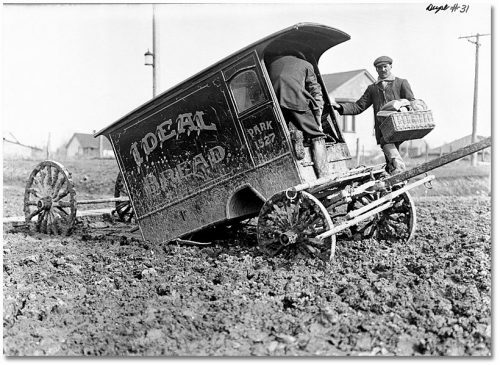 In 1919, Dr. Hastings recommended methods to safeguard bread “from human contamination, dust, dirt and flies.” He felt bread should be wrapped or covered, and not touched with bare hands. The plight of this delivery wagon in Earlscourt, a suburban neighbourhood near St. Clair Avenue and Dufferin Street, shows why “dust, dirt and flies” might be a concern. Another area of concern was meat production. Inspectors found cattle living and being slaughtered in filthy conditions. 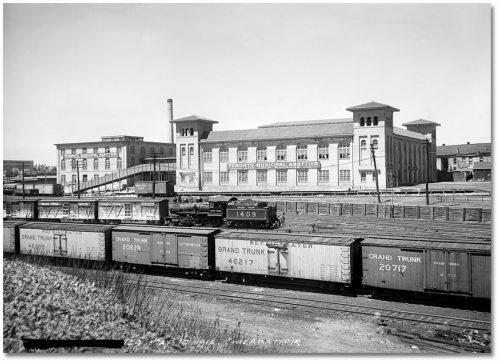 To address this, a City-run abattoir was opened in 1914 on Tecumseh Street. 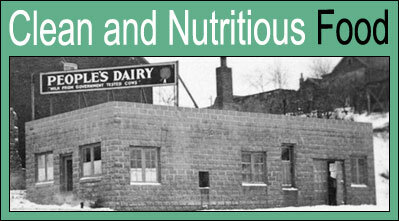 It was operated by the City for 45 years, until it was sold in 1959, after changes to the Public Health Act meant that the City could prohibit the sale of any fresh meat it hadn’t inspected, regardless of where the animal was slaughtered. A private slaughterhouse still operates in the building. 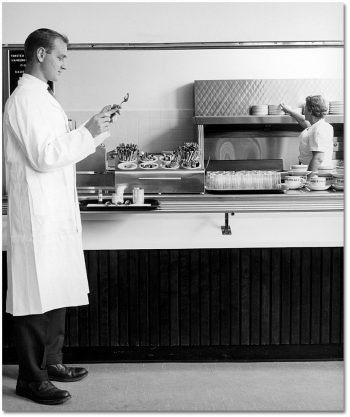 Before electric refrigeration, ice was required to keep food cool. 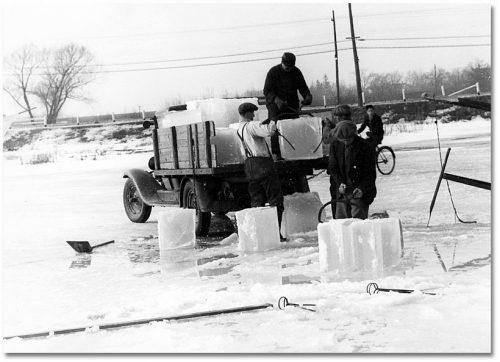 Regulations governing ice cutting were established in 1888, and applied to everyone selling ice in Toronto even if the ice came from outside the city. Ice from polluted waters could be sold for cooling purposes, but it had to be labelled so the purchaser would not let it come in contact with food. 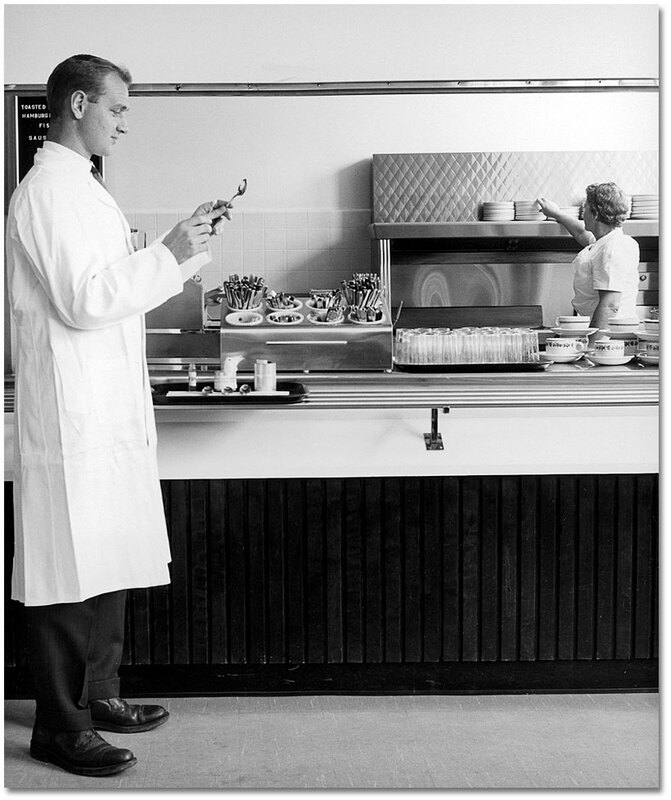 In the 1950s and 1960s public interest in eating a healthy diet was increasing and the department supported this trend by integrating nutrition teaching into its programs. The Department of Public Health used an innovative method to demonstrate the effects of poor eating habits to teenagers. 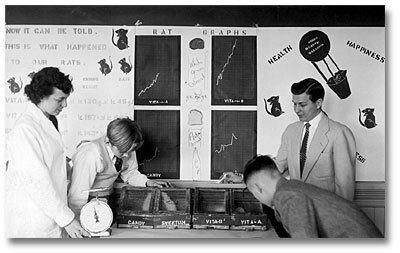 They used rats in “animal feeding experiments” set up in some high schools. Certain rats were fed a healthy diet, while the rest were fed corn flakes and pop, with predictable results.